The injured toucan arrived at veterinarian Carmen Soto's office like so many others: Beaten, emaciated and near death. The toucan, which had been attacked by a group of teenagers, spent his first few days at the ZooAve rescue center in Costa Rica’s Central Valley fighting for his life. “He was covered in blood and in a lot of pain,” Soto says. “He couldn’t feed himself because the entire top half of his beak had been knocked off." Soto and her team nursed the toucan back to health and gave him a name—Grecia—for the small mountain village in which he was found. Then, they snapped a photo of Grecia’s profile, the line of his smooth beak abruptly ending in a shattered stump. The grotesque image went viral, catching the attention of Dutch traveler Luciano Lacayo. 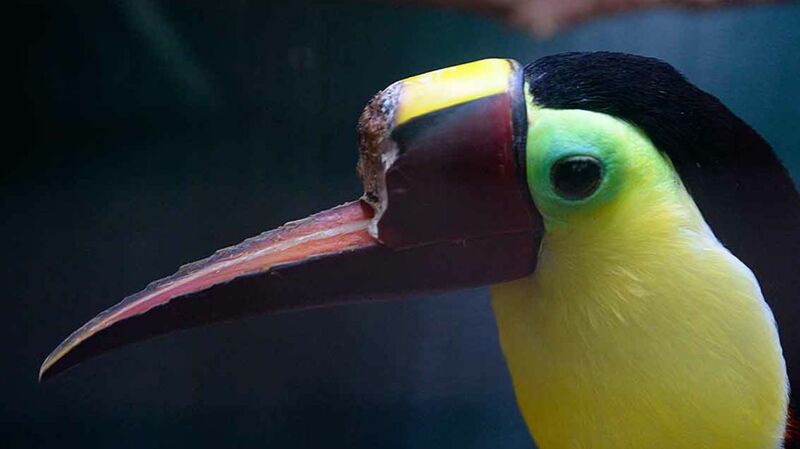 Believing he could help the poor toucan, Lacayo started a crowdfunding campaign and raised more than $10,000 to create a prosthetic beak. In a few months' time, the bird will be fitted with his new plastic bill—which will have been made using a state-of-the-art 3D printer. Grecia is now an unwitting part of a technological revolution. The toucan isn't the first animal to benefit from this technology, but his beak will be the most complex advancement yet in the new field of 3D-printed prostheses. The high cost of human prostheses has long been a challenge for amputees and people born with missing limbs, but 3D printers have begun to change that. Unlike traditional manufacturing, 3D printing can create an object in almost any shape by reading a digital model. Using cheap materials, companies and non-profits can now print simple prosthetic hands and arms for as little as $50. The technology has also allowed for more flexibility, opening the door for beautiful designs. Before the advent of 3D printing, the field of animal prostheses also suffered from design limitations and high costs. “The biggest thing 3D printing has done is broaden our patient base and allow us to create cooler and more functional designs,” says Derrick Campana, the director of orthotics for the Virginia-based company Animal Ortho Care. Last year, Campana was part of a team that produced the first-ever set of 3D printed prosthetic dog legs for a husky named Derby. Derby had been born with underdeveloped front legs and could not walk, but traditional prosthetic legs would not fit him. Using a 3D printer, Campana helped design a loop-style prosthesis that would hold Derby’s shrunken front legs and allow him to run. But 3D printing’s real advantage is that it can serve wild animals, like Grecia, whose anatomy was once considered too complex for a prosthesis. The method was first tested on Beauty, a bald eagle in Idaho whose beak was shot off by a hunter. Using a 3D printer, rescuers built a new nylon-based beak for Beauty, enabling her to feed and clean herself. Unfortunately—despite Beauty’s newfound independence—her new beak was not strong enough to allow her to return to the wild. “The misconception is that [3D printing] is always cheaper and more efficient,” Campana says, “but the materials aren’t quite durable enough yet for most situations." Questions still remain as to how well a 3D printed prosthetic would hold up out in the wild. Grecia will likely remain in captivity, but the 3D printing companies making the prosthesis hope that by observing the toucan with his new beak, they may glean tips to help other wild animals in the future. “There are things we already do very well that we are learning to do better through this process,” says Nelson Martinez, the founder of ewa!corp, one of the companies designing Grecia’s beak. “It’s possible that one day we will release an animal into the wild with a 3D-printed prosthesis."